Recently, a large prospective study provided additional information concerning the debated possible association between habitual coffee consumption and risk of hypertension (HPT). Therefore, we updated the state of knowledge on this issue by carrying out a comprehensive new systematic review of the literature and a meta-analysis of the available relevant studies. We performed a systematic search for prospective studies on general population, published without language restrictions (1966–August 2017). A random-effects dose–response meta-analysis was conducted to combine study specific relative risks (RRs) and 95% confidence intervals. Potential non-linear relation was investigated using restricted cubic splines. Four studies (196,256 participants, 41,184 diagnosis of HPT) met the inclusion criteria. Coffee intake was assessed by dietary questionnaire. Dose–response meta-analysis showed a non-linear relationship between coffee consumption and risk of HPT (p for non-linearity < 0.001). 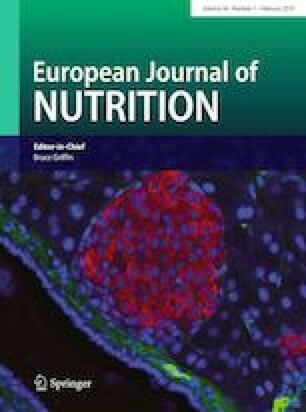 Whereas the habitual drinking of one or two cups of coffee per day, compared with non-drinking, was not associated with risk of HPT, a significantly protective effect of coffee consumption was found starting from the consumption of three cups of coffee per day (RR = 0.97, 95% CI = 0.94 to 0.99), and was confirmed for greater consumption. The results of this analysis indicate that habitual moderate coffee intake is not associated with higher risk of HPT in the general population and that in fact a non-linear inverse dose–response relationship occurs between coffee consumption and risk of HPT. The online version of this article ( https://doi.org/10.1007/s00394-017-1591-z) contains supplementary material, which is available to authorized users. LD conceived the study aims and design, contributed to the systematic review and to the data extraction, performed the analysis, interpreted the results, and drafted the manuscript. ELF contributed to the systematic review and to the data extraction, contributed to interpretation of results, and drafted the manuscript. LS contributed to the preparation of revised version of the manuscript. FG contributed to the systematic review and to interpretation of results, and drafted the manuscript. PS contributed to the systematic review, interpretation of results and drafted the manuscript.